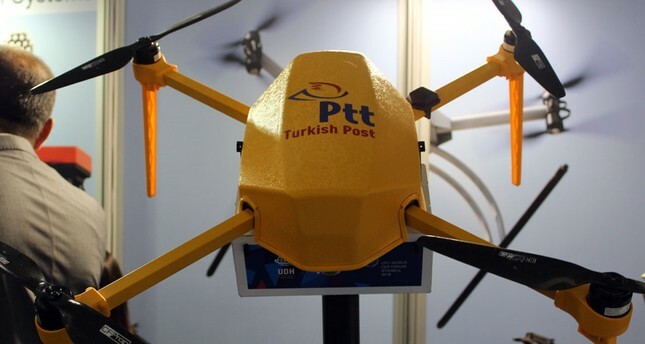 Turkey's state-run postal service, the PTT, aims to launch a drone delivery system in 2019, a step forward on its way to becoming a global brand with drone application for cargo transportation. "We hope that the drone deliveries will start this year," PTT Director General Kenan Bozgeyik said. The PTT is going through a paradigm shift in provision of services, he told Anadolu Agency (AA). The PTT had also launched a project to set up a network of automatic lockers and parcel machines aimed at overcoming inflexibility in the delivery process, Bozgeyik noted. Bozgeyik indicated that customers would simply enter an access code to open one of the lockers at the movable terminals called "Cargomat." A number of such terminals have been set up in the capital Ankara, with more Cargomats expected in Istanbul and İzmir, Bozgeyik said. Meanwhile, a drone for cargo transportation was showcased for the first time in September of last year at the SAHA EXPO 2018, a three-day defense exhibition. The drone developed by Turkish engineers with completely local and national means will be used predominantly at points where geographical conditions hinder transportation. Drones to be used by the PTT were will be autonomously controlled from a center without a driver, with a control stick, as previously stated. The address to where they will deliver cargo will be defined. After the package reaches the designated spot of the defined task, drones will be able to return to the region where they take off from, again without a driver. Currently, the PTT reaches all corners of Turkey with more than 42,000 employees, nearly 5,000 offices, 156 mobile offices, nearly 3,000 cash points and more than 9,000 vehicles.